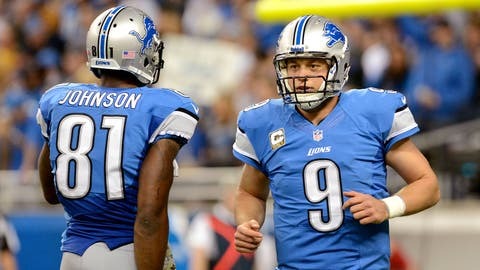 Calvin Johnson and Matthew Stafford make Detroit a premier place to coach. ALLEN PARK, MICH. — The Detroit Lions have one playoff victory in the last 56 years and only two winning seasons since Barry Sanders retired. But at least they know how to fire a head coach. Practice makes perfect, one supposes, but Lions fans had a few reasons to be encouraged by the manner in which head coach Jim Schwartz was cashiered after five mostly moribund seasons. Team president Tom Lewand and general manager Martin Mayhew said the right things in front of television cameras Monday, pointing out (credibly) that this might be the NFL’s most coveted head coaching vacancy. They also made clear the new hire must be ready to win immediately – a sensible expectation, given the presence of quarterback Matthew Stafford and wideout Calvin Johnson on a talented roster. As Lions linebacker Stephen Tulloch observed Monday, the team’s “window” is closing rapidly. Schwartz had a reported two years and $12 million left on his contract. That didn’t stop the Ford family from cutting a massive check, because, as Lewand put it, Detroit fans deserved a better performance than what the Lions had been delivering. That gesture, however expensive, will earn a little cred with the talk-radio crowd. Mayhew acknowledged that NFL head coaching experience would be beneficial for the new boss, so you can expect plenty of Lovie Smith and Ken Whisenhunt rumors. The Lions don’t have time for someone to grow into the role, as Schwartz did. Schwartz can be credited for a postseason berth in 2011 and general return to relevance. But someone with the résumé he had when the Lions hired him in 2008 – that is, a youngish defensive coordinator – will not be the next coach here. The Lions must be refined, not rebuilt. Schwartz wasn’t equipped to finish that job because he was scarcely able to complete a season. In five years, he had a 12-32 record from Nov. 1 onward. The Lions said they need better, and maybe, just maybe, they know what better looks like.